There are various uthsavs in a year. Seva of Shrinathji is systematically performed. The style of dress, the items in food, and the jewellery are all prescribed and this is followed since years. There is no change. This uthsav gives importance to green colour. Everything is green i.e. the dress, the flowers and Jewellery of Shrinathji on this day. On this day Shrinathji, wears a turban and a pichwai exhibits dark monsoon clouds and rain. Radha also is seen in the pichwai, showing her love for him. This Uthsav gives importance to Peacock. 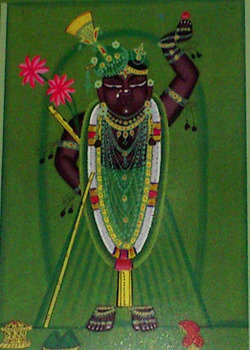 Shrinathji wears a crown, ornaments of peacock, 24 banian trees are placed in the Dotibari (Doltibari). Shrinathji wears saffron colour dress, Different types of toys are placed in front of him. He is bathed with Panchamrat. Midnight is the time of his birth. The band starts playing music and the bells are rung. A21 Gun salute is fired. This is the uthsav following Janmastami, Nandlal dances with Gopis and Gopas . This is the birthday of Murlidhar the son of Girdharji, Gosainjis eldest son. A shield and sword is placed in front of Shrinathji because Ram won over the Ravana. This uthsav is on a full moon night. Shrinathji is mostly dressed on white clothes with white utensils i.e. silver and white jewellery i.e. Diamond. During this festival the cows are decorated and brought into the temple in the evening. Shrinathji is royally dressed on this day with exclusive ornaments. Shrinathji puts a crown similar to the ears of cows. The cows are brought in Puja Choke to play. The villagers from distant places come to loot the rice at night which is in huge quantity i.e. 2300 Kg. These villagers are known as Bhil Tribals. They carry this as Prasad. This Ekadashi reminds us that Lord has awaken after four months and a mandap of sugarcane is made where the marriage of God and Tulsi is celebrated. This is considered one of the most auspicious day of the year. One does not have to see an Muhurat for any type of function. Spring has arrived and hence a pot is placed before Shrinathji, with various flowers and branches of the trees. Gulal is sprinkled on Shrinathji. This Uthsav is after the Holi, Gulal is sprinkled on the devotees. Navnitpriyaji is placed on the swing near Shrinathji. Shrinathji is dressed in white colour so also the pichvai is also white. In the evening, a person dressed as Aurangzeb comes and sweeps the step of Suraj pole with his bread. Shrinathji was pleased with him and blessed Aurangzeb who was one of the Fortunate Mughal Emperor because of Shrinathji’s blessing in fact he became blind and Shrinathji cured him after he prayed from Dhruv Bari. His mother was a loyal devotee of Shrinathji. Shrinathji, is dressed with pink and particularly everything offered to him is pink in colour. This is the uthsav of Yamunaji. Shrinathji, Shrinathji wears white light dress. 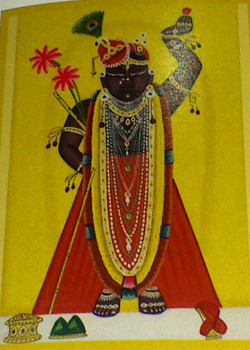 Shrinathji wears a simple dhoti and uparna. He is bathed with saffron water and offered 1, 25,000 Mangoes. It is chariot festival. A tiny toy silver chariot with horses is placed. Shrinathji wears white dress with white turban.